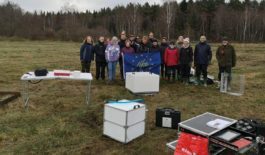 Together with nine partners from Poland, Germany and the Baltic states the LIFE Climate Mitigation project “Peat Restore” was established in 2016. During five years the project aims to rewet degraded peatlands in the partner countries, covering an area of 5,300 hectares to restore the natural function as carbon sinks. In the project the emissions and storage of greenhouse gases, the water level as well as the wildlife (flora and fauna) will be documented, analysed and compared. This helps to prove rewetting measures and gives the chance to regulate aberrations quickly. Also the potential climate effects of the rewetting can be calculated. 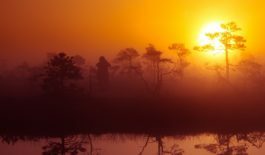 The project’s experience as well as best practice scenarios to reduce greenhouse gases will be summarized in a guide of rewetting peatlands, which can be used by various stakeholders. Adapted management plans and restoration concepts for each of the project sites will be elaborated to ensure the achievements in the long term. National events, information materials, a photo exhibition and a documentary film will contribute to raise public awareness and to inform about the project’s progress. In rewetted peatlands, the mineralisation of peat is stopped and due to water saturation, peat can accumulate again. Carbon dioxide (CO2) from the atmosphere is fixed and stored in the peat through biological processes for the long term. That’s why conservation and restoration of peatlands must be taken into account in a climate policy with the aim to reduce greenhouse gas emissions in a great extent.